Nordonia Hills City Schools recognizes and respects all those who serve the United States Military, especially military families. We are dedicated to aiding our military families by providing an individualized support team and additional resources to our military connected students. We also consider ourselves ambassadors to the military by providing special programming and events that raise awareness and promote military opportunities and patriotism. The USO of Northern Ohio takes care of our Active Duty, National Guard, and Reserves and their families in the 31 Northern counties in Ohio. The USO of Northern Ohio provides support for all service members and their families in the service area. These include supporting unit events, offering Tickets for the Troops to sporting and entertainment events, United Through Reading, Daddy-Daughter Dances, Baby Sea Bags, and more! Military OneSource - Wouldn’t it be great if children came with instructions? As a military parent, you have the next best thing to parenting instructions – a wealth of parenting resources, benefits and programs. Military OneSource is by your side through the journey of parenthood – through the early years and tricky teen years. Whether it’s finding quality child care, learning about adoption, helping your kids excel in school or connecting to resources, Military OneSource is here for you. 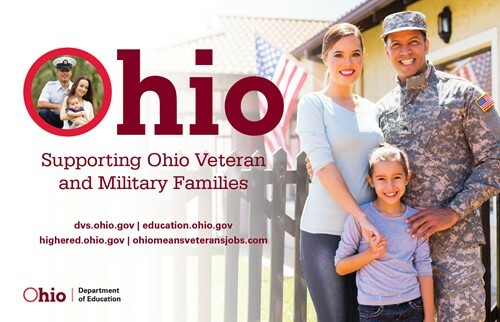 Ohio National Guard’s Family Readiness Program - This program provides information and tools for Ohio families, including educational resources, youth camps and recreational opportunities. Ohio Inter-service Family Assistance Coalition (ISFAC) - The ISFAC serves as a statewide “safety net” in support of Ohio military families. The ISFAC connects military families with national, state, regional and community resources as well as volunteer support services. Army OneSource - Army OneSource, Army Child, Youth and School (CYS) Services works with parents, students and schools to mitigate the challenges resulting from children switching school systems because of family relocation or deployment of a parent. Touching Base - Touching Base is a quarterly U.S. Department of Education newsletter for the military community.